Your Safety and the Safety of fellow staff and students at CIT is of the utmost importance and your co-operation in all matters associated with Health & Safety is very much appreciated. Your Department Safety Manual , reference section 11 Department Standard Operating Procedures. What are CIT’s Evacuation Procedures? Staff are requested to familiarise themselves with fire exits and the emergency evacuation procedures for the Institute. Evacuation routes and assembly areas are posted in each classroom and laboratory. Fire drills may occur from time to time throughout the year. There will be planned and unplanned Evacuations of all Campus areas which test to see how long it takes to leave and assemble at designated points adjacent to the buildings in an emergency situation. 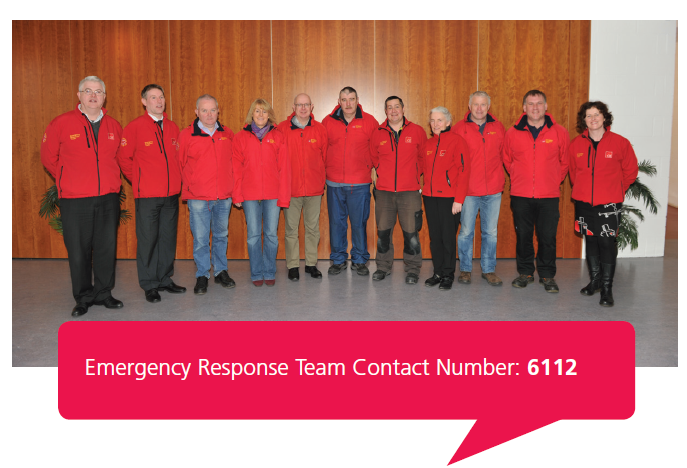 For details of assembly point locations, emergency numbers and location of A.E.D. defibrillator - refer to the emergency procedures card which is available in various locations in the Institute. What do I do if I am involved in an accident/incident on campus? All accidents/incidents involving staff and/or students must be reported to the Head of Department/Function and promptly recorded on an accident report form. 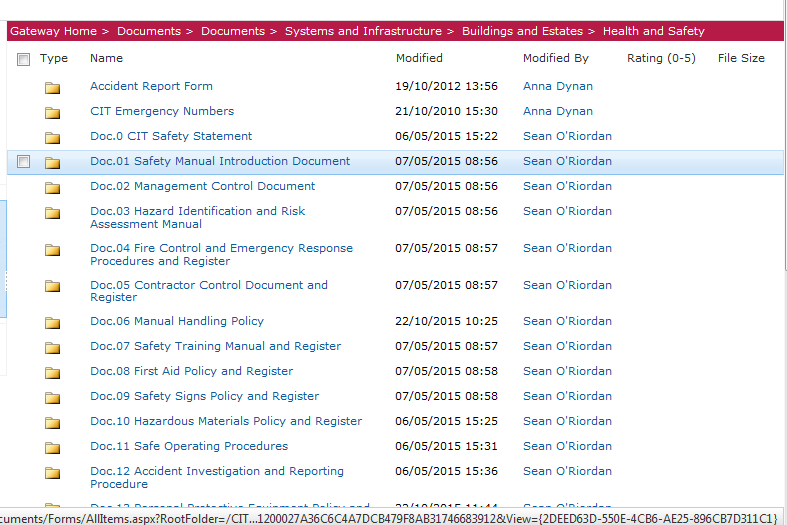 Guidance for all Accident Recording & Investigation on site can be found in the Department Safety Manual. The Head of Department & Head of School should be informed immediately of all serious accidents or incidents and where possible accident reporting will be completed before the end of the day in which the accident occurred. 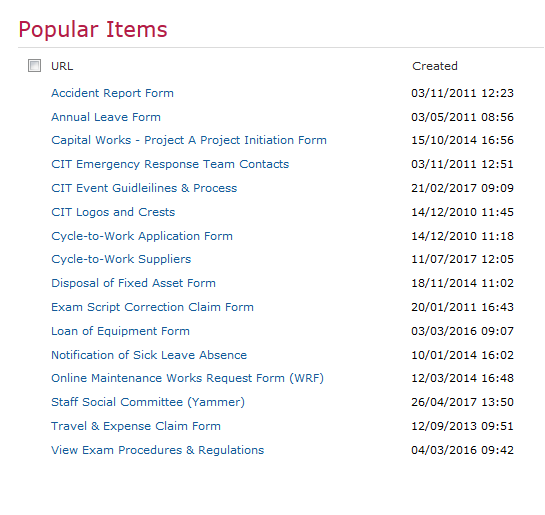 The Accident Report Form is available to download from the Staff Gateway home page under “Popular Items”. Where can I get First Aid treatment on campus? Where work locations contain hazards with an element of risk or injury, whether low, medium or high risk, Cork Institute of Technology provides suitable first aid equipment and trained First-Responders. All work locations have a suitably stocked and accessible First Aid Kit to meet the needs of the staff and students. Make sure you are aware of the First Aid facilities on site and how to contact a First Aider in the event of an emergency. What is the Emergency Response Team? If over 35 years - Chest Pain Yes/ No? If trauma - Severe Bleeding Yes/ No? When using a mobile phone dial (021) 4326112. What are the regulations regarding driving on campus? The speed limit within Cork Institute of Technology is set at 15km/Hour. This speed limit was introduced to ensure safe access and egress of staff and students to the various parts of the Campus. When driving on CIT grounds you are expected to comply with the speed limits posted on site and provide pedestrians right of way at designated crossings. If you have any safety concerns, contact the Caretakers at ext. 6219. Designated parking facilities are provided for staff within the CIT Bishopstown campus, NMCI and CCAD (limited). Parking on all campus roads is forbidden; parking is only permitted in marked parking bays within designated car parks. Vehicles parked outside designated parking areas may be clamped in situ, or removed to a pound on-campus where they may be clamped or otherwise rendered immobile, until the appropriate fee is paid for their release. Vehicles remaining within any campus after gate-closing time will be detained within the campus at the owners risk until the campus reopens and the vehicle owner/driver makes arrangements for release. Vehicles are parked at the sole risk of the driver/owner. The Institute accepts no liability for loss or damage to vehicles or their contents while parked or detained within any CIT campus. If you are a smoker you must use the designated smoking shelters. The legislation is that 10 metres outside every building is to be a non-smoking area. This is for the protection of people working in the building.